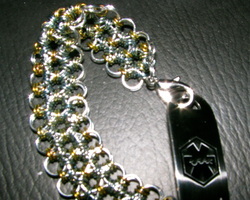 It's a medic-alert bracelet in light-weight aluminum and niobium chain maille. Lobster claws hold the ID alert to the bracelet, allowing easy updating. If you look closely, the Japanese 12-in-1 design resembles Jewish stars. Stay tuned, other versions are coming in seedbeads with crystal or pearl.